The second day of action at the Final Four Tournament of the 2014 CEV DenizBank Volleyball Champions League – Men got started with Poland’s JASTRZEBSKI Wegiel surprisingly edging past former winners Zenit KAZAN in four sets (25-21, 20-25, 25-17, and 25-23). The Tatars disappointed even more than they had done in Saturday’s semi-final with their compatriots of Belogorie; JASTRZEBSKI, on the other hand, did not miss the chance to claim their first CL medal thereby improving on the fourth place they had to be content with at the 2011 Finals in Bolzano, Italy. This is also JASTRZEBSKI best result in the European Cups, taking into account that the team from Silesia had medalled only once before, winning silver in the 2009 edition of the Challenge Cup. JASTRZEBSKI also have a silver medal from the 2011 FIVB Club World Championship on their resume. As for Zenit, the Tatars missed out on a medal for the first time since 2010, thus completely failing to emulate the ladies of Dinamo KAZAN who last week had won the women’s title in Baku. Though still disappointed after their defeat to Belogorie, Zenit KAZAN was certainly determined to claim at least bronze to add a fifth – and fourth consecutive – medal to their resume in the CEV DenizBank Volleyball Champions League. After seizing the crown in 2008, Zenit went on to claim silver in 2011, gold in 2012 and bronze last year after they lost another Russian derby in the semis to Lokomotiv NOVOSIBIRSK. Going into this match, there were actually a few similarities with last year’s Final Four in Omsk where Zenit had lost to their compatriots of Lokomotiv and then played a Polish team, Zaksa, in the bronze medal game. Last year’s victory over Zaksa could be seen as a good omen for the Tatars but JASTRZEBSKI was also determined to improve on their fourth place from the 2011 edition. The “orange crew” from Jastrzebie-Zdroj showed right from the start their support for the players mentored by Lorenzo Bernardi who were off to a flying start (5:1) on excellent serves by Michal Kubiak. A time-out asked by Vladimir Alekno did not help Zenit find their way into the game with JASTRZEBSKI confidently leading the way (8:2) at the first technical break. Shortly before the start of the match Bernardi had revealed he found it very difficult for his side to stand the challenge brought by teams with a multi-million budget, but as the guys of Zenit seemed to lack the necessary motivation, JASTRZEBSKI kept on scoring (12:4) to the delight of their fans. Zenit eventually woke up and reduced their gap on two aces by Matthew Anderson (14:10), but Wegiel played very intelligently, avoiding the tall Russian block to keep their control over the match (18:13). Slowly but surely Zenit clawed back also exploiting some mistakes made by JASTRZEBSKI whose lead was reduced down to two points by the score of 21:19. Bernardi stopped the game and after this short break his players changed gear once more bringing home the first set on a fast tempo by Alen Pajenk (25-21). The second set followed a completely different plot, with the players of Zenit KAZAN finally showing some glimpses of their class to contribute a very close start (7:7). 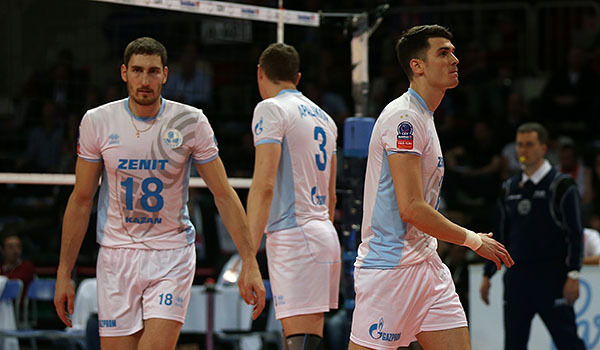 As far as Zenit was concerned, there was still one fundamental where their performance still looked as shaky as in the semi-final with Belogorie: the serve. This lack of consistency prevented KAZAN from breaking away in the score (12 all) and it was JASTRZEBSKI that eventually succeeded in claiming a very narrow margin by the second technical time-out (16:14). Zenit responded by scoring two straight points thereby restoring the balance and forcing Bernardi into a time-out; a neck-to-neck race continued all the way through to 18 all before Zenit finally edged past their opponents on three consecutive points by their superstar Maxim Mikhaylov (21:18). By the end of the set it was JASTRZEBSKI that missed a few serves thereby paving the way for Zenit that was back in contention for bronze (25-20). JASTRZEBSKI did not seem too concerned about this setback opening the third set with a series of three unanswered points before leading the way by 8:5 at the first technical time-out. The guys from Silesia displayed their best performance since the start of the Final Four weekend (11:7) thereby cementing their credentials for a second European medal after the silver won in the 2009 edition of the Challenge Cup where they lost the final to Arkas IZMIR. Though from time to time Zenit KAZAN were able to live up to their status of Volleyball powerhouse, the Tatars made a way too many mistakes to compensate for the gap they had accumulated earlier in the set (16:11). The relentless players of JASTRZEBSKI fully exploited the chance they were given cruising to a rather surprising 2:1 lead (25-17) with their undisputed leader Michal Kubiak cashing the last point of the set. Zenit KAZAN efficiency in attack had dropped down quite dramatically in the third set – 30% - and that figure could easily explain the sloppy performance showed by the Tatars who had therefore react on a last call to save their honour and add another medal to their CL collection. They attempted a comeback in the early stages of the fourth set leading 9:6 but Wegiel responded promptly to draw level at 9 all. Zenit scored another three straight points to make it 12:9 but again JASTRZEBSKI fought their way back evening the score at 12. The flurry of mistakes made by the players of Zenit continued through the remainder of the set, and in the end the “orange crew” could start their well-deserved party to celebrate Wegiel’s first medal in Europe’s elite club competition.